My shoulders tense up as I sit in front of a computer all day. It really does work - there is a significant reduction in pain. I swear by these to ease the pain and stiffness of a cricked back. 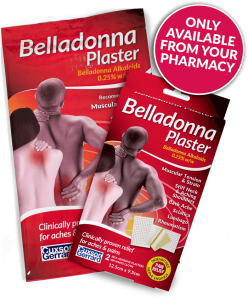 Very impressed with the plaster… used it on my shoulder, eased the pain, good value, thanks. BELLADONNA PLASTER PRODUCT INFORMATION: Belladonna Alkaloids (as Hyoscamine) 0.25% w/w. Indications: For the relief of aches and pains, such as – muscular tension and strain, stiff neck and aching shoulders, sciatica, lumbago, rheumatism, backache. Legal Category P.
Product Authorisation Holder Cuxson Gerrard & Co. Ltd. Contains Belladonna Alkaloids. Always read the label.